The National Constitution Center’s Election Central was an interactive exhibit in 2011 that matched up individuals with candidates in the 2012 race for the presidency. Instead of just voting outright, visitors were asked to agree or disagree with statements each candidate made on 3 issues the visitor cared about the most. 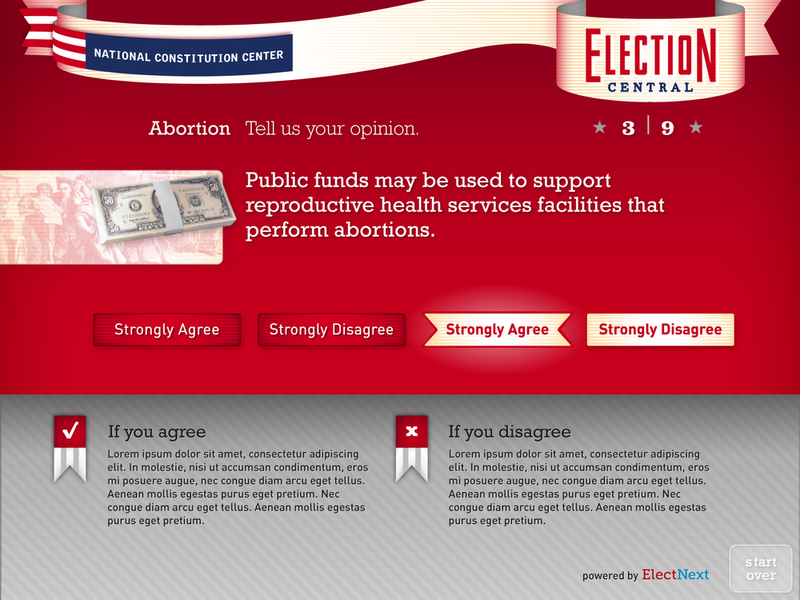 The user was then shown how their choices aligned with the candidates. Sometimes the results were surprising and tested the visitor’s own presumed political leanings. The center projection cycles through random match-ups and displays the results determined by actual votes cast by the Center’s visitors..
Just like Election Day, booths were set up complete with curtains for visitors to interact with the screens. Their results are immediately added to the overall results and the main projection is updated. The windows that ran along the back of the exhibit space were wrapped with graphics displaying the history of American Presidential Elections through statistics and other numerical factoids. When visitors enter the booth they are asked to choose their two most important issues and answer some questions to see where they stand. Afterwards, they place a vote based on their assumptions and in the final step it is revealed which candidate actually best match based on their responses. Participants are often surprised to see who they actually stand with on the issues that are dearest to them. After the election passed, the exhibit was re-designed to be more evergreen. Instead of choosing between candidates in a real-time election, visitors were invited to vote in fictional matches between presidents from Truman to GW. See Election Central’s second incarnation here.